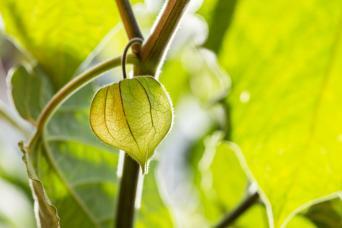 The Chinese lantern plant (Physalis alkekengi) is also called bladder cherry, Chinese lantern, Japanese lantern, or winter cherry. This plant is a herbaceous perennial that is native to southern Europe east across southern Asia to Japan. The Chinese lantern plant is named because of the bright orange to red papery covering over its fruit, which looks like a Chinese lantern. All parts of this plant are listed as poisonous, although the ripe fruit and very young leaves are used in herbal medicine. The dark green, heart shaped, foliage grows to a height of 23-35 inches high and a spread of 23-35 inches. The small white flowers bloom on a stalk in mid-summer. 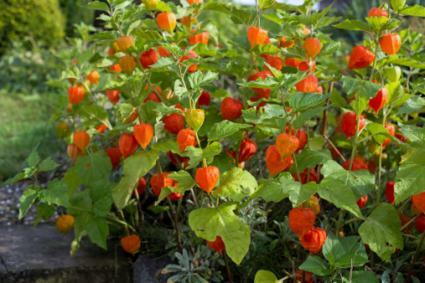 Chinese lantern plants like full sun with a bit of shade in the heat of the afternoon. They grow in USDA zones 5-10. They prefer rich, loamy soil. If your soil is not rich, you can add three inches of compost to it, till it in to a depth of six inches, then plant the Chinese lantern plants there. 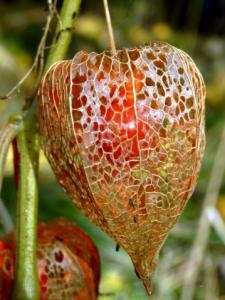 The Chinese lantern plant can be grown from seed, by dividing the rhizomes it puts out, or purchased at a nursery. If you cannot find it at your local nursery, check Burpee or Amazon. To grow from seed, sow the seeds in late spring, after all danger of frost has passed. Do not cover them, as they require light to germinate. They can also be started indoors on a heated pad that keeps the growing medium to a temperature of 70-75 degrees F. The germination period is approximately 20-25 days. Plant seedlings two feet apart in the garden after all danger of frost is past. Water them in well. Chinese lantern plants need to be watered once a week until established. Do not over water or you will induce root rot. Fertilize with a balanced fertilizer, such as a 10-10-10, once in the spring and once in the summer. After established, the Chinese lantern plant is reasonably drought resistent, but will produce more flowers and fruit if irrigated and fertilized. Cut back and dispose of foliage in the late fall after the first hard frost. Divide plants in the spring if they become too big or spread too much. Chinese lantern plants are subject to many insect pests, including false potato beetles, cucumber beetles, and flea beetles. Neem oil will kill these pests when used according to the label directions. This plant is considered deer resistant. The Chinese lantern plant attracts butterflies. It is used as an accent plant, for borders, and edging. It can become invasive and Dave's Garden readers note that it is invasive in the New England area of the United States. For this reason it is often grown in containers. It is nice as a cut fruit or a dried fruit. To dry the fruit, cut the stalk at the ground. Strip of the leaves and hang in a cool, dry place for a few weeks. This plant used to be used in herbal medicine, although it is not used much anymore. It can cause an abortion, so should not be used by pregnant women. 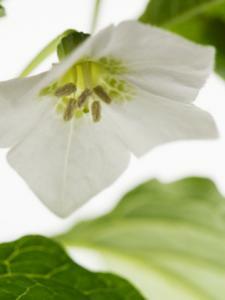 A homeopathic remedy is made from the fruit that is used to treat kidney and bladder disorders. Because the Chinese lantern plant fruit is at its peak in the early fall, it is often used as a decoration for Halloween or just fall in general. This attractive plant can serve as an accent in any garden and continue providing decoration as a dried plant well into the fall.